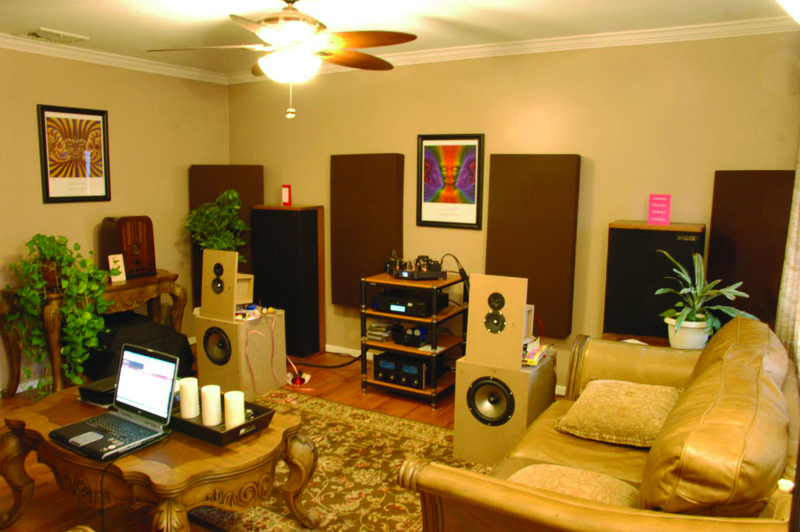 If you work with sound at home, then you probably are not satisfied with the sound of your room. Especially if you’re recording sounds and music. And we assume that you have no particular desire to spend a lot of money on the right equipment. So we will tell you how to improve the sound of your room, spending the minimum of money and effort on it. Changes in the room the First thing you need to understand and correct the shortcomings of their premises. You need to check how the sound is reflected from surfaces. When you make a sound, it bounces off the nearest wall and goes to your eardrum. Room, which poorly reflects the sound will distort and spoil them, reducing your work. Become middle of the room and clap your hands. If you hear a trembling echo, you have something to fix. Get rid of the hard surfaces. Sound reflections occur due to the fact that the sound waves hit a hard surface. Avoid wood, cement, glass or leather surfaces. If you noticed in the Studio the walls are always covered with a special material. And in a small rehearsal rooms that have no money for expensive insulating materials, for wall hanging simple pieces of cloth or even carpet. Add furniture and decor. Filled the room a large object, you allow the sound waves to “jump” in different directions, reducing their reflection. Pay attention to the sofas and bookshelves, carpets and curtains. Have you noticed that professional studios very often oddly-placed armchairs, sofas and other furniture? It’s not just. Each subject is in accordance with the calculated proportions and works as a scavenger of reflections and reverb. If possible, install the resonator: a panel absorber or a Helmholtz resonator. This will help reduce reverberation. But due to the fact that resonators absorb only certain frequencies, you will likely have to change audio settings every time the song changes. The location of the monitor. Your monitors should “look” to the far end of the room and each must be located at the same distance from the nearest wall. This will help you to bring the sound to perfect. The correct location of the monitors should be at ear level. To do this, purchase a special rack or just put the monitors on stacks of books. Position the monitors in the corners of a regular triangle. Ideally, the monitors should be approximately a meter away from each other, each must stand at least 20 cm from the wall somewhere in meter from the listener. Look at the diagram below and you will understand how they should be placed. The point at which you will be called perfect. Note that the location of the monitors and the listener based on symmetry. It is very important in the work with sound. Microphone If you are going to record sound at home, you not only need to take into account all the above, but also to work on the microphone. Let’s start with the fact that you have to buy the MIC that fits the source audio that you record. This means that for vocals and every instrument needs a different microphone. So study carefully the information about the microphone before buying it. Eventually you will understand where in your room the best place for the violin, and for the singer. You can also try different points of your room to understand in which of these points you should write your tool.